Welcome to my round up of March 2015. I’m going to focus on being more consistent with these monthly updates, and include a wider range of culture consumed if I’ve got something to say. I’ll also be including brief updates on my writing. I finished my run through the Xbox One game Dragonage Inquisition. I don’t play many games these days – too much other stuff going on in life, work and writing. But I thought I’d mention Dragonage particularly. Its strong emphasis on story telling made the experience very enjoyable (and a bit addictive – my wife has been a bit annoyed at the amount of time I’ve spent with the game). There is a wonderful spread of gender, sexual orientation and general diversity in the casts of characters, and a lot of the writing/voice acting is surprisingly well done. Well worth the price of admission if you like your fantasy epic and your games role playing. My wife and I have been watching, and enjoying, the TV series Grimm. Season 4 started recently on Foxtel, so we’ve been following along over the last couple of months. I really like Grimm – the take on the storybook monsters is interesting and there have been some great storylines over the first three seasons. Season 4 has been good so far, and I’m particularly enjoying the digging into the broader world building. They have introduced/developed some of the female characters over the last season, which has provided some good balance to the earlier series (which was very male-dominated). This season continues the “strong women” theme. I also dipped into up and coming Australian SF author David McDonald’s work, with his recently released short collection Cold Comfort and Other Tales. You can read the full review here, but spoiler alert – I liked it! I’ve been a bit disturbed by how few of the Ditmar and Aurealis award nominated novels I’ve actually read. With that in mind, I’ve started by Australian speculative fiction award nominated reading with The Lascar’s Dagger by Glenda Larke. A full review will come soon (it will double as my first Australian Women Writer’s 2015 challenge novel as well). I’ll be moving on to Thief’s Magic by Trudi Canavan, Bound by Alan Baxter and Clariel by Garth Nix over the next few weeks. I’ve also nabbed Phantazein by Tehani Wessely. That will get me through the Ditmar shortlist (when you add in The Godless by Ben Peek that I reviewed last year), but there are still a lot of novels on the Aurealis lists that I’ll need to get to. On the writing side, I’m still struggling to find time to edit my novel length manuscript Unaligned. I’m finding that while I can write first draft materials in fits and starts, I don’t seem to be able to dive into editing without a long stretch of time (at least a couple of hours). A busy job and two small kids don’t provide many opportunity for that kind of time. As a result, I’ve been feeling a bit stalled over the last month or so. To break the impasse, I’ve started writing some more first draft material for other work just to make sure the daily creative juices are flowing. I’ve done a bit of editing on a shorter work and I’m trying to use shorter amounts of time more effectively. We’ll see! So, what have you been watching/reading/playing/writing/creating lately? Update us all in the comments below. This review sort of forms part of my contribution to the Australian Women Writers 2013 Reading Challenge. All my proper 2013 AWWC reviews can be found here. I don’t think I can officially claim this as an Australian Women Writer’s challenge book, as only 6 out of the 13 stories are penned by Australian women. However, it show the work of many of Australian speculative fiction’s current batch of award winning female authors (think Kaaron Warren, Angela Slatter, Thoraiya Dyer, Sue Isle, Tansy Rayner Roberts, Sylvia Kelso), so I’ll probably promote this through AWW channels. And in my mind I’ll count it as a 1/2 contribution to my target. 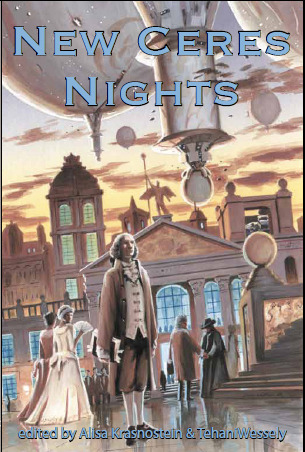 New Ceres Nights was published in 2009 by Twelfth Planet Press. The premise of the anthology is that the stories are all set in the shared world of New Ceres, a planet in the outer colonies that has embraced (and ruthlessly enforces) an 18th century way of life. Apart from a single spaceport connecting it to the rest of the human race, the technological level of the whole planet has been wound back. I found the background to this anthology interesting. The introduction by New Ceres Board members Tansy Rayner Roberts and Dirk Flinthart, tells of a world built by an online community of mainly Australian speculative fiction writers, artists and fans. This was a bit before my time (as regular readers of this blog know I have only been involving myself in the Australian spec fic scene for the last year or two), but it seems like a fascinating experiment in using the internet to build community. As far as I can tell, the New Ceres project is gone (all links seem to lead to dead-ends and defunct sites), so reading this anthology feels like a glimpse into a now departed phase of Australian speculative fiction history. A few other artefacts survive (such as the book Angel Rising by Dirk Flinthart) as well as some cryptic references to an eZine, but that is about it. It’s too bad – I liked what I’ve read so far. It would have been fascinating to have a look at all the shared “source material” as well just to see how the world was constructed. It reminds me of a recent Kickstarter the Massive Fiction Project, which is aiming to build a shared world for fiction writing. I’m interested in these kinds of endeavours and constructs, would have been great to see an Australian attempt. If any reader of this article was involved in the New Ceres shared world experience, I’d love to hear from you in the comments section below. Anyway enough tangental musings, why don’t we return to the actual book. From the back blurb: “New Ceres Nights presents thirteen exciting stories of rebellion, debauchery, decadence, subterfuge and murder, set against the backdrop of powdered wigs, coffee houses, balls and duels”. The mixture of 18th century limitations and illicit high technology made a surprisingly powerful combination, reminiscent of some of the better steampunk stories I’ve read. All the stories were quite good, I can’t really call out one I didn’t like. As is my habit, I’ll only comment on those stories where I have something to say – which is no reflection on the other stories of course! The first story of the collection, Debutante by Dirk Flinthart, gives a very effective introduction to the world of New Ceres. Set somewhat before the rest of the anthology, it is an origins story of a sort. Flinthart’s dialogue is particularly sharp, and the ending to this tale gives you a real sense of the tone of the collection. The contrast between the first story and the second (The Widow’s Seven Candles by Thoraiya Dyer) is quite stark, as the reader is thrown from a relatively hi-tech scenario to a very low tech one. Dyer’s writing is very engaging, and she creates a very sympathetic lead character in the candlemaker Etienne. Murder in Laochan by Aliette de Bodard was notable in its use of a non-European 18th century backdrop. I also quite liked the conceit behind the main character, and found the story a delight to read. Speaking of interesting conceits, Tontine Mary by Kaaron Warren (whose work I have been enjoying a lot of late) draws on an actual feature of 18th century life, the tontine. A tontine is essentially a lottery, where a group of people put in money and the last surviving member gets it all. Warren captures the life of the title character marvellously, so much so that her parting “gift” to her great grand-daughter is all the more affecting because of the sympathy you have developed over the course of the story. Tansy Rayner Roberts‘ background as a comedic writer comes through in the somewhat arch Prosperine When It Sizzles. Sharp dialogue and great pacing made this a very enjoyable read. Blessed Are The Dead The Rain Falls Upon by Martin Livings introduces an element of the detective noir genre into the world of New Ceres. I enjoyed the change of pace, and the point of view character was well realised. The anthology is rounded out by The Piece of Ice in Miss Windermere’s Heart by Angela Slatter. This story, extremely well written, had one of my favourite characters of the book, the gentlewoman thief Ms Violet Windermere. While filled with humorous asides, Slatter does engender a connection with the character that left me wanting more. All in all I found that I really enjoyed this anthology and have no hesitation in recommending it. The good people at Twelfth Planet Press tell me that the cryptically referenced eZines from the New Ceres shared world days are being published as eBooks. The first was released just a couple of days ago. Good timing on my part, no?